Mowi Lemmer ensures top-quality fish products. Our company has been certified for many years according to both the BRC and IFS standards. The standards of the British Retail Consortium – a British trade organization of retailers – are among the strictest standards in the food industry; The IFS Food Standard was developed on the basis of these BRC standards and is supported by e.g. the German, French and Italian associations of food retailers and distributors. Independent certification bodies perform annual audits to verify compliance with these standards. Mowi Lemmer complies with the highest levels of both standards: For BRC this is the AA level, for IFS this is ‘higher level’. Our BRC and IFS certificates can be downloaded here. Qmarine is our Total Quality System. It encompasses the worldwide Mowi standards set to ensure that we operate in a responsible and consistent way throughout the company with regard to our responsibility for society, animals, nature and the environment as well as our employees. Our quality assurance is based on a worldwide quality management database that contains all Qmarine standard operating procedures. These procedures provide guidelines on how to act and how to reach decisions with regard to each of the strategic pillars of Qmarine. They enable us to maintain the same high standards throughout the entire Mowi organisation. Mowi undertakes to supply safe and documented food products. All our activities are organized in such a way that we can produce our food products in a safe manner and can protect their integrity. We constantly monitor and safeguard our products’ safety and integrity. We regularly align our way of working with the most recent scientific insights and best practices and make sure we comply with the current legislation and regulations of the countries where we produce and sell our products. Mowi Lemmer supplies food products with a high quality, both technically and nutritionally, in order to fulfil the needs of our customers as well as consumer expectations. As to their technical quality our products comply with the agreed specifications. With regard to their nutritional quality we ensure that our fish and fish products are good sources of high-value proteins, important minerals, vitamins and omega-3 fatty acids. Mowi Lemmer highly values the efficient production of safe, healthy and tasty food. This is needed to be able to feed the ever increasing population around the globe while at the same time taking care not to deplete the planet’s natural resources, which are of the utmost importance for the survival of fauna and flora, as well as mankind. According to research done by the Food & Agriculture Organization of the United Nations (FAO) the world’s population will increase to close to 10 million people by 2050. This growth will be accompanied by an increase of the standard of living which will enable more people to eat more protein-rich food such as meat, eggs, milk and fish. These combined developments are expected to result in doubling the worldwide demand for food by 2050. The most important challenge facing global food production is the limited availability of natural resources, such as production areas, fresh water and energy. At the same time the emission of greenhouse gasses will also have to be reduced. The best opportunity to fulfill the increasing demand for healthy and sustainable food lies in the oceans. 70% of the globe is covered by water, but only 2% of the worldwide food supply comes from the oceans. Yet we have to take into account that these resources are not limitless. If we want to make sure that future generations will also be able to enjoy delicious fish we need to invest in sustainable fisheries and aquaculture: That is why Leading the Blue Revolution is Mowi Lemmer its vision. Fish is one of the most efficient animal protein sources: It takes much less feed to produce 1kg of edible fish than is needed to produce the same quantity of meat. The carbon footprint of fish is considerably smaller than that of meat. Mowi minimalizes the environmental impact of its activities and operates in harmony with the environment, by taking care not to deplete natural resources and not to use any materials or substances that may cause a lasting impact. By far the largest part of the fish species that are processed by Mowi Lemmer are from MSC certified sustainable fisheries or from ASC certified responsible aquaculture. Our product range offers a large number of products which have been certified according to independent standards for responsible aquaculture and sustainable fisheries, such as ASC and MSC. 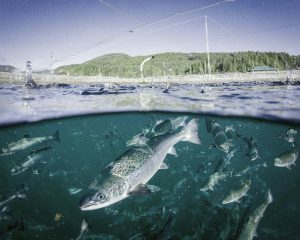 Next to the ASC certified salmon from Mowi's own salmon farms we can offer top-quality sustainable fish products from our worldwide sourcing network. MSC – the Marine Stewardship Council - is an independent ecolabel which ensures that the fish has been caught sustainably. MSC’s objective is to protect oceans and safeguard seafood supplies for this and future generations. ASC – the Aquaculture Stewardship Council – is an independent label for responsibly farmed fish, shellfish and crustaceans. Fish with the ASC label comes from farms that limit their impact on water and the environment, take good care of their employees and take the interests of the local communities into account. Mowi Lemmer committed itself to have all its salmon farms ASC certified by 2020, and is well underway to achieve this. To ensure and further improve the sustainability of our sourcing we developed several sustainability programmes in cooperation with our suppliers. These start with an internal assessment by our procurement department on the basis of a supplier manual and may be followed by an external assessment on the basis of third-party scientific research. When selecting and choosing products our focus is on sustainable fishery and aquaculture methods and on safeguarding biodiversity. To achieve this we actively cooperate with a network of suppliers, customers, researchers and universities at home and abroad. This way we aim to make an active contribution to new environmentally and socially sustainable developments. Mowi Lemmer has ‘chain-of-custody’ certificates for ASC, GLOBALG.A.P. and MSC, which ensure that the products we sell with one of these labels are really coming from certified responsible farms or certified sustainable fisheries. Good health management and husbandry practices are at the basis of fish welfare. We make sure that the living conditions of our fish are in accordance with their biological needs and that the chances of stress, aggression and wounds are minimalized. We continuously monitor the health status of our fish and act immediately in case this is compromised. The palm oil we use in some of our products comes from RSPO certified palm oil productions. RSPO stands for ‘Roundtable on Sustainable Palm Oil’. This is a not-for-profit organization with over 3,000 members worldwide, all of which support the importance of sustainable palm oil production: palm oil producers, processors and traders, consumer goods producers, retailers, banks & investors, and environmental and social justice NGO’s . The RSPO developed a set of environmental and social criteria that companies must comply with in order to produce Certified Sustainable Palm Oil (CSPO). The correct implementation of these criteria helps to minimize the impact of palm oil production on the environment and on the local communities in palm oil production areas. The members of the RSPO commit to produce, source and/or use RSPO certified, sustainable palm oil. Our RSPO membership and certificate underline that the palm oil we use comes from sustainable palm oil production. One of our guiding principles is ‘People’. Protecting the safety, health and human rights of our employees is a core value for Mowi. We want to offer our employees safe and meaningful jobs. In order to successfully operate and maintain good relations with the local communities in which we work the safety, self-respect and personal pride of our employees may never be compromised. We find it important that also the companies from which we source our fish take care of their employees and respect their rights. This is illustrated by our compliance with the SMETA (Sedex Members Ethical Trade Audit) 4-Pillars criteria. SMETA 4-Pillars was developed by the AIM (Association des Industries Marque) to go further than the criteria of the standard SMETA-audit, one of the most widely used ethical audit formats in the world. SMETA 4-Pillars is a common audit model that emphasizes environmental and business integrity. The 'Letter of Confomity' shows that we comply with the SMETA 4-Pillars criteria.